TSSA, Ranga Reddy District – Child information and child tracking system online uploading of Aadhaar number of students and enrolment drive for Aadhar in Govt. and private schools in the district – guidelines – communicated – Reg. As per instruction of Government of India, Child Info collected and updated in the online which is useful for tracking the child and ascertaining the retention status and this also help to contain the duplication of enrolment or bogus enrolment. The State Project Director has communicated detailed guidelines for taking upof special drive for Aadhar Enrolment, station deployment plans for enrolment of children in the district. The Special Drive should completed by 15.12.2015. The District project office of TSSA and District Educational Officer in the District will monitor child Info and child tracking system in “childinfo.tg.nic.in” . As per UDISE 2014-15, there are 10, 32,563 students pursuing elementary and secondary education (Classes I – X) in both Government & Private Management. 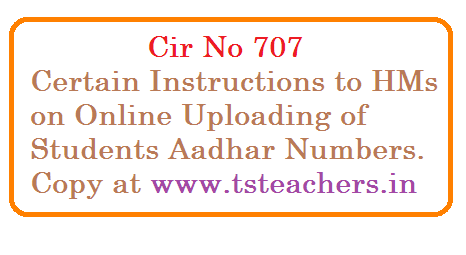 · No of students having Aadhaar UID 1, 79,906. In view of the instructions of the GOI and SPD TSSA TS, Hyderabad, the following steps are to be undertaken. After filling up the Aadhaar Friendly child wise format of all classes the same should be handed to over to CRPs. The numbers of students given in the Aadhaar Friendly child wise format should tally with UDISE 2015-16 enrollment.